Truth be told, Clarisonic’s Sonic Face Brushes have changed our skincare game. And this is for a good reason. Clarisonic, other facial brush systems and Clarisonic dupes claim to provide gentle exfoliation that leaves your skin cleaner and softer than traditional methods with an added benefit of improved blood floor for a healthier looking skin (source). Seriously, who doesn’t want healthier looking skin without acne, blackhead, excess oil and dirt? I know I do! 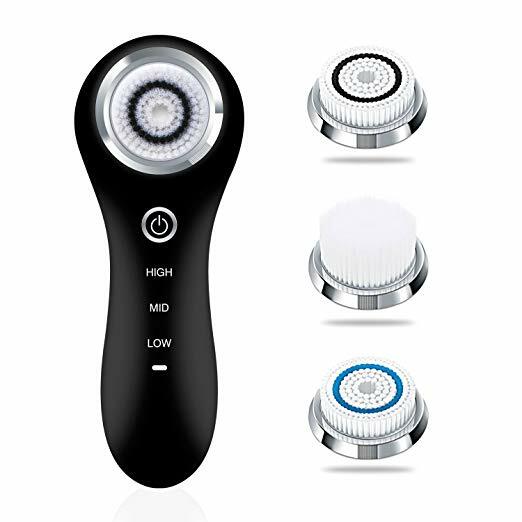 A simple look at the best-selling Clarisonic Mia 3-in-1 system reveals a price tag of $199! Then you add the cost of getting brush heads and recommended cleansers, and you’re looking at spending closer to $300. We’ve all been there. You want a product that works: a mix of soft and hard bristles, impressive ranges of power, long-lasting, and most importantly, affordable. 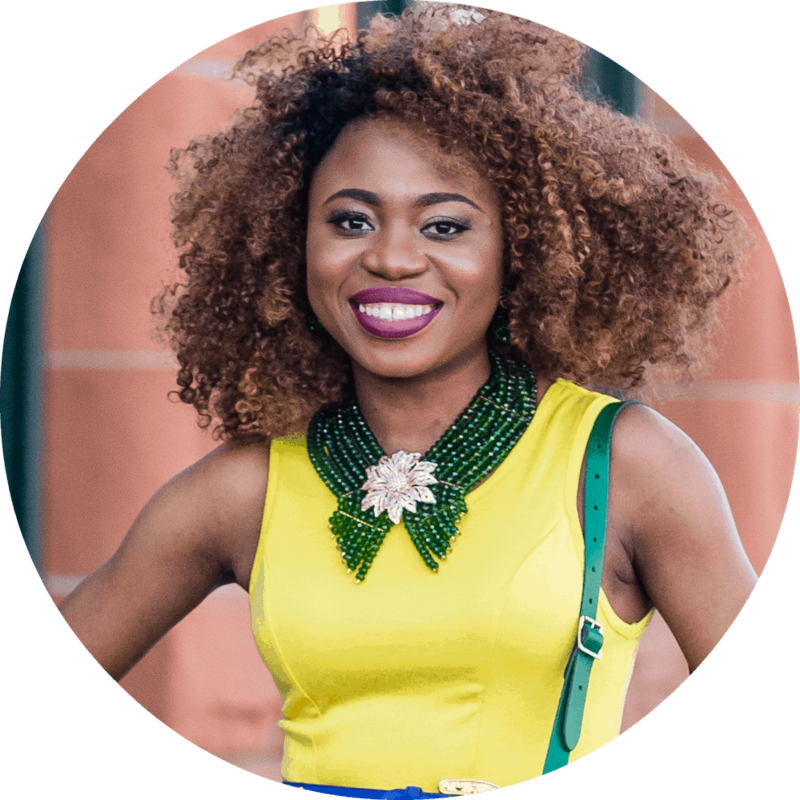 That’s when I discovered these Clarisonic dupes – products that promise great results at a price you’re happy to pay. 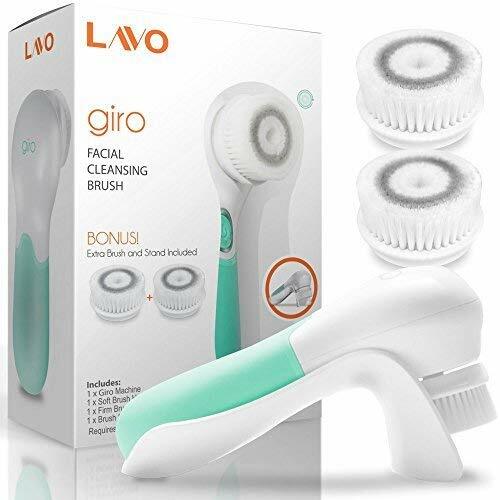 The LAVO Cleansing Facial Brush is an absolute steal when you compare its features to the price. Not only does it exfoliate and invigorate your skin, but it has two different settings depending on the sensitivity of your skin for a smooth and painless result. You also get 2 different brushes (soft and firm) and a bonus drying stand. This exfoliating cleanser is perfect for all skin types. With just two standard AA batteries, you can get this water-resistant Clarisonic dupe ready for use with the touch of a button. The incredibly high waterproof rating of the LAVO Facial Cleansing system means you can even use this in the shower! The premium quality Dupont brush fibers will lift off dirt from your pores and leave your skin feeling baby soft. This facial cleansing brush by Olay is the Ferrari of Clarisonic facial brush dupes. In fact, when I could not justify the hefty price tag of the Clarisonic Mia, I went in search of a more affordable alternative. 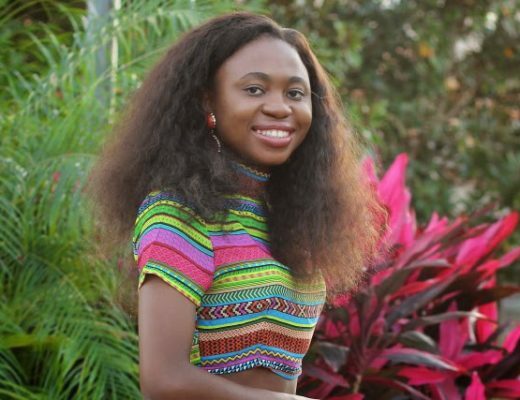 The Olay Prox was perfect for my needs. Now with over 5,900 reviews and an average 4.1 rating, I can see why most people are happy with their purchase. This Clarisonic dupe features two-speed settings that deliver deep cleansing and exfoliation with fibers that feel soft and smooth. The Etereauty Facial Brush is ideal for those who need a wide variety of exfoliating options. If one or two brushes are just not going to cut it for you, you’ll love the Etereauty facial brush set. Included in this set are five brush heads for maximum clean. There is a brush for gentle wash all the way to vigorous deep-cleaning. This Clarisonic facial brush dupe has a superior waterproof rating of 7 (IPX7). This means that you can fully immerse this device in water up to 3 feet (1 meter) without any problems (source). This means that showering just got even better! 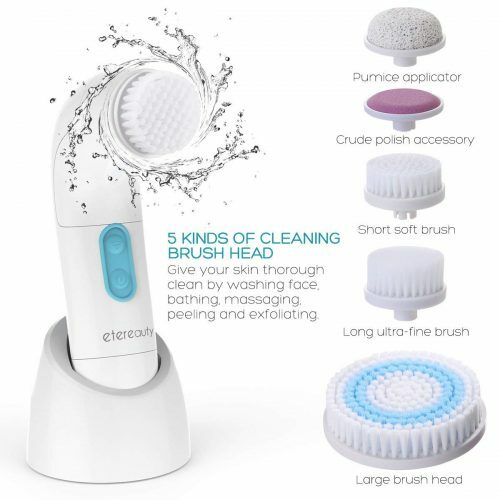 In case you’re wondering, all 5 brushes – 2 small brushes for facial cleansing, 1 sponge head for makeup removal, 1 pumice head for removing calluses, and 1 large brush for body-cleansing are included in this Etereauty facial brush system. 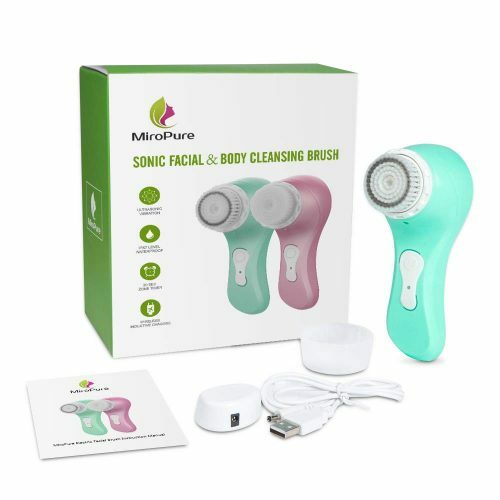 The MiroPure facial brush set uses ultrasonic vibration technology to remove dirt, blackhead and minimize pores while providing gentle exfoliation. This small handheld Clarisonic dupe is the definition of small but mighty. This cleansing system is a powerful device with vibrations up to 220 million times per second, yet gentle on the skin. It also has a twenty-second timer that turns off the brush once the cycle is complete to avoid over-brushing. You even have the option of using batteries or USB charging modes with this electric cleansing system. The convenience of the cordless charging station cannot be overemphasized for use on the go. Included with this MiroPure Sonic set are DuPont brushes for your face and body. One facial cleansing brush and one body brush. Unlike most other systems, this kit offers 4 daily cleansing modes (sensitive, deep clean, exfoliate and pulse-lift) for any skin type. The Pixnor is the hottest and #1 best-selling facial cleansing brushes on Amazon right now. The electric cleansing system is small, lightweight, waterproof, and durable. The 2-speed setting combined with a slew of cleansing and exfoliating brush heads work through dirt, makeup, and debris for flawless skin. The Pixnor facial brush system is one-eighth the price of the Clarisonic Mia cleansing brush yet delivers professional results and much more. The decision is simple: what’s not to love about PIXNOR? Meet the Essential Skin Solutions Exfoliation & Cleansing System. All of your face and skin care microdermabrasion needs in one nifty package! This electric cleanser brand has created their own line of brushes with soft bristles that target blackheads, acne, and acne scars with a powerful touch that leaves the skin feeling refreshed, and looking flawless. What’s especially nice about this Clarisonic dupe is that the product also doubles up as a body brush. And a pumice stone to keep your heels free of calluses! If you’ve had your eyes on more expensive facial brushes, you would love this cleansing system by My Life My Shop. 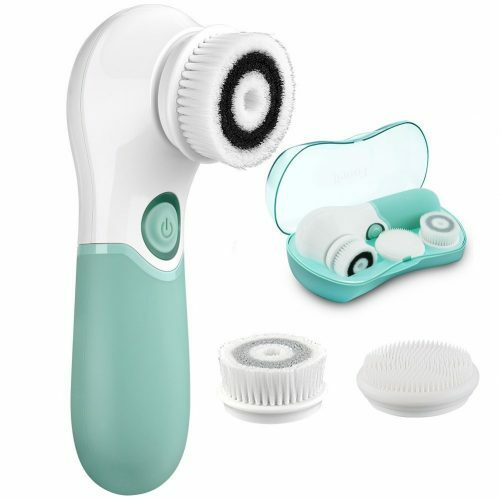 This electric brush set is comparable look-alike (color, size, and features) to the $130 Vanity Planet Ultimate Skin Spa cleansing system for a fraction of the price. 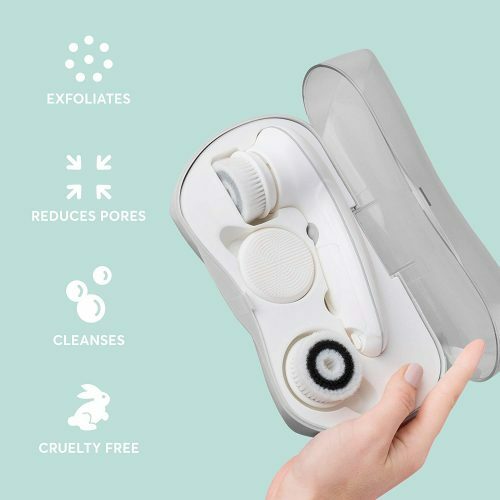 Unlike other Clarisonic dupes, this electric cleanser features a unique silicone brush head for dry or sensitive skin. You also get an exfoliating bristle brush for weekly use and a cleansing bristle brush for daily use. Silky soft but tough enough to get into those hard to reach places, the Koovon Facial Brush gets the job done for a fraction of the cost. With 3 brush heads (daily cleansing, exfoliating and silicone facial brushes) and a durable ABS storage case, this Clarisonic facial brush dupe is the perfect travel companion. The 2-speed settings of the Koovon cleansing system offer up to 300 rotations per second for a deep and refreshingly clean appearance. Not to mention a gracious 18-month warranty should you not love your brush! Meet Freshme’s sonic facial cleanser. A non-rotating electronic cleanser boosting of superior IPX7 waterproof rating capable of removing the pore-clogging facial oil and makeup. The soft brush silicone bristles give you a deep and gentle clean. The $169 Foreo Luna just met its match! 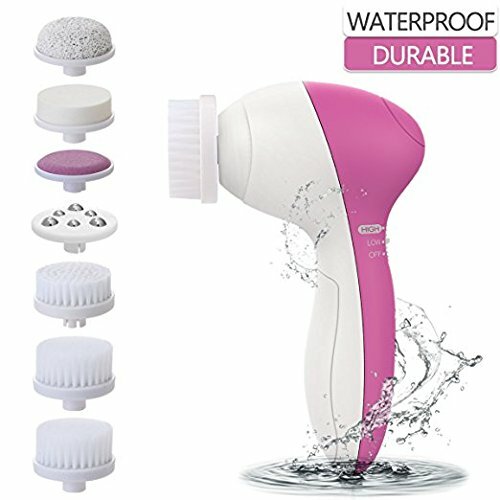 This facial brush system includes a secure charging port and a unique waterproof design that takes shower-ready facial brushes to the next level. Give it a try, and find out if this is the one for you! Up next is the sonic face brush by Hangsun with an impressive 300 oscillations per second for a smoother, softer and radiantly glowing skin. 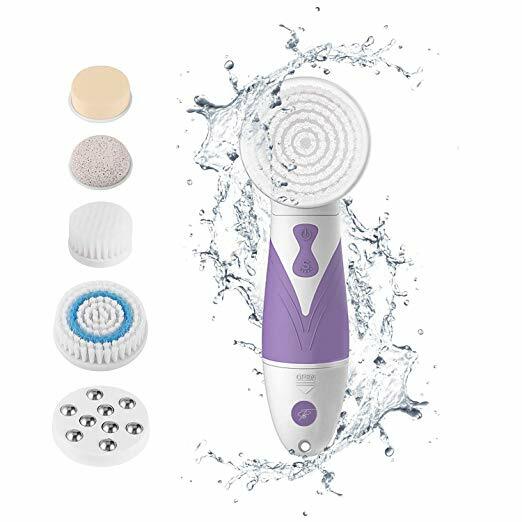 This electric device claims to provide deep cleansing 7x better than hands alone. And there’s more! 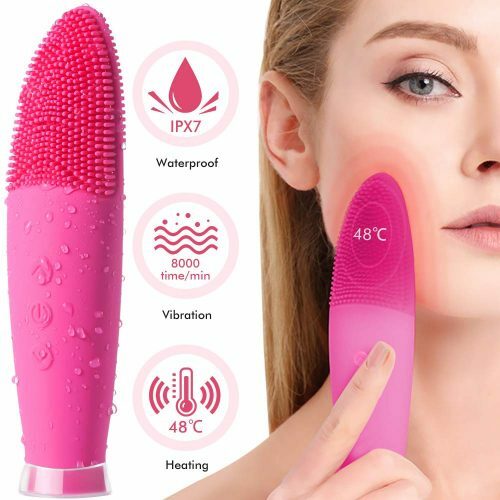 The Hangsun facial brush set has a top-notch waterproof rating of IPX7. This rating means it can be fully immersed in water up to 3 feet (1 meter) (source). 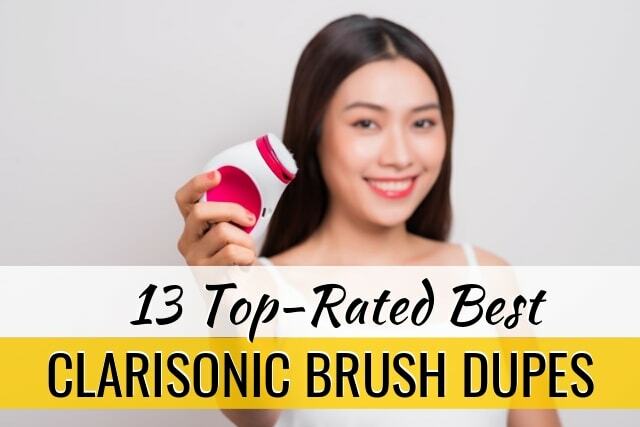 Although not as expensive as the Clarisonic Mia II, this electric facial system is the most expensive on this list of Clarisonic facial brush dupes. You can read more about this Hangsun electric face brush sc200 review here. The Teegan Beauty 5-in-1 Cleansing Brush kit is the set that keeps on giving, as when you buy one brush, you get five replacement brush heads along with it! No facial brush lasts forever. In fact, it is recommended that brush heads be replaced once every three months for optimal results. With this Clarisonic dupe, you get 5 brush heads! This electric cleanser was made FOR women BY women and promises 100% satisfaction guarantee if you’re not happy with the product. And for a limited time, you can save an additional 25% on this super affordable Teegan Beauty brush set (automatically applied on checkout). You’ve probably heard about the Proactiv 3-step system. 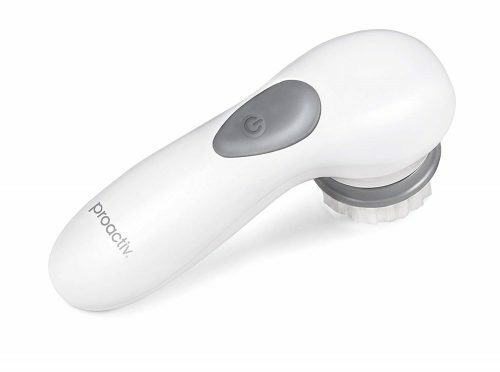 This Proactiv Deep Clean brush is an excellent Clarisonic dupe for a fraction of the price. This deluxe facial brush was specifically made for those with acne-prone skin to help you get a radiant skin without the irritation. Although it only has one brush, the 360-degree continuous rotation and two-speed options gets the job done quickly and effectively. Last and certainly not this least in this list of Clarisonic facial brush dupes is the SOLO Mia cleanser and massager. With a solid 4.3-star rating from over 850 reviews, this electric cleanser is Amazon’s Choice for sonic facial cleansing brush. 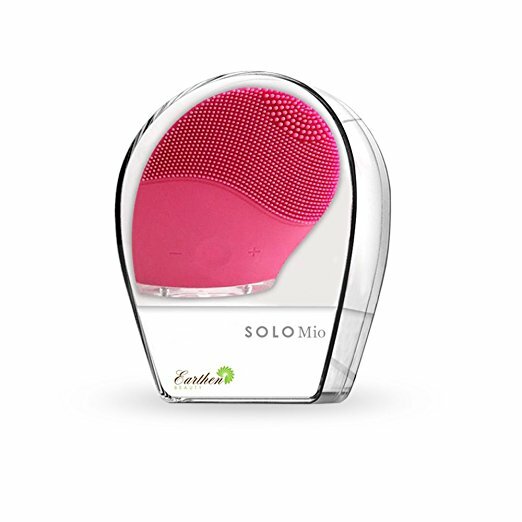 And if you’re thinking the SOLO Mio looks so much like the $169 Foreo Luna, you’re right on the money. It is a waterproof (IPX6 or IPX7) and portable device with a chic carrying case. The silicone bristles provide gentle pulsations to clean the skin deeply. Use this Mio cleansing system with TruSkin Naturals Daily Facial Cleanser and Vitamin C serum for the best result. This extremely lightweight device at a mere 5.6 ounces (0.35 lbs) is a traveler’s ultimate dream! Still want more? Check out more Clarisonic dupes on Amazon! Click on image to shop each facial brush dupe. How often do I have to replace the brush heads? For most facial cleansing brushes, it is recommended that you replace each brush head every 90 days (3 months). This ensures optimal results with the system and reduces dirt and bacterial buildup. What is the best cleansing brush for your face? When it comes to finding the best cleansing brush for your face, it all boils down to your needs. However, the Clarisonic was the pioneer of cleaning brushes. Among Clarisonic brushes, the Clarisonic Mia takes the cake. The Foreo Luna and Vanity Planet Ultimate Skin Spa have both made a name for themselves. 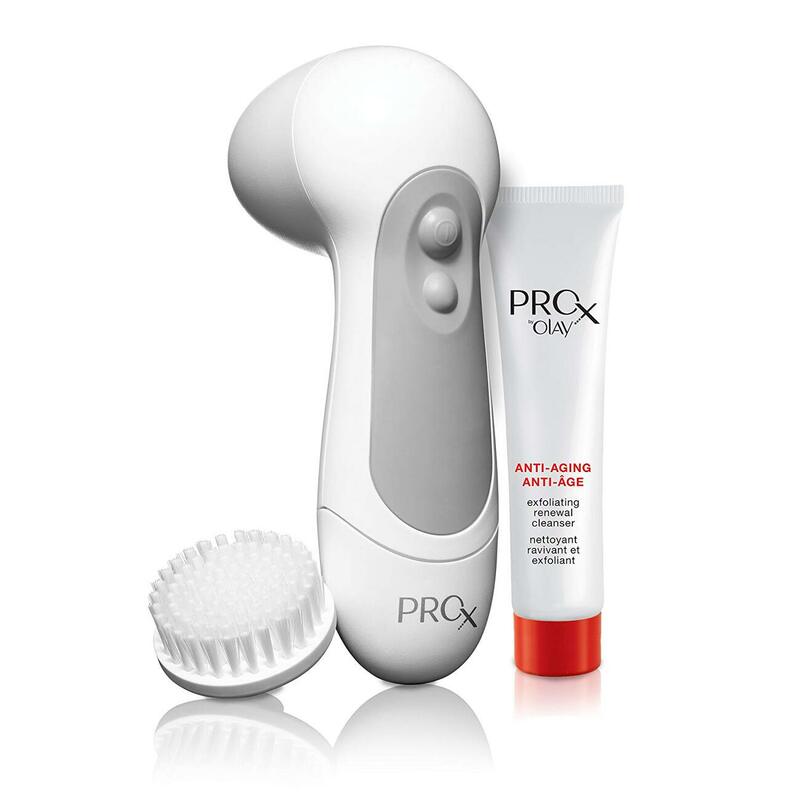 One of the most highly-raved Clarisonic dupes is the super affordable Olay ProX which I’ve used and loved. Are face cleansing brushes good for your skin? Yes! But remember to use it in moderation according to the needs of your skin. They act as gentle exfoliators to remove makeup, dirt and dead skin debris from your face. Should you use a facial brush everyday? It depends! 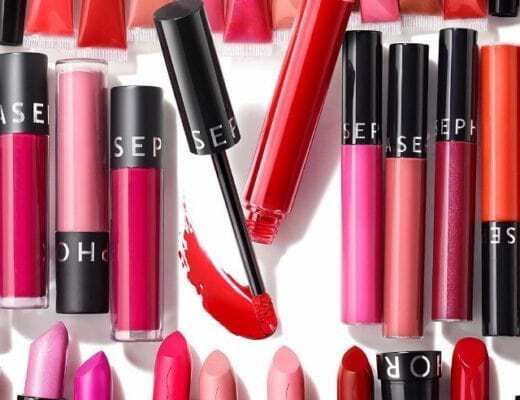 According to this article by Allure (source), stick to once or twice a week for first-time use. This allows your skin to build tolerance. As the name suggests, daily facial cleansing brushes can be used 1-2 times a day. While exfoliating brushes should be used no more than 1-2 times a week. Excessive use can damage your skin. Do face brushes help with blackheads? How do you disinfect a face brush? Facial brushes literally do the heavy lifting for you by exfoliating dirt, dead skin cells and clogged pores. If not properly cared for, your brush can become a harboring ground for bacterial growth. The best way to prevent bacterial buildup on your brushes is to wash them after use. Place the face of the brush under warm running water for a few seconds to remove residual material. And as recommended, your facial brush heads should optimally be replaced every 90 days (source). All these are awesome devices! They are so helpful to have a beautiful skin and body. I have had the Olay brush. It worked great. I just never knew when to change the head. I don’t do makeups so I never knew these kind of products. I do however wants to be pampered once in a while . I have heard good things about that Solo Mio cleansing brush. And one of my friends has the Olay one and really like it. With so many brushes on the market it seems overwhelming to know which one or ones would be worth it. I think my wife would like this post. Thanks for sharing! What a great list for someone who doesn’t have one of these facial brushes yet! I agree that the original product’s pricetag is too high, and that these dupes all do a great job for much less money! I have never had one of these kinds of brushes. It looks like there are some pretty cool products out there. Thanks for sharing! My tween has been asking me for one and I wouldn’t know where to begin. I would go with the Olay brush. Great bang for your $. The Olay Prox is the only one I’ve ever seen in stores. Love my Clarisonic but these less expensive options are huge money savers. I actually have a Clarisonic brush, and I really like it. I bought my husband the male version of it, and he has liked using it, too. I have to invest in one of these for my skincare collection. I always hear about all of the amazing benefits. Having teenagers in my house the more I can learn about skin care the better! My son is just starting this journey and I am hoping that we can keep his skin as clear as possible. wow! i actually work in the beauty industry and even i didn’t realize there were this many Clarisonic dupes! This is quite a list–wow! Right? Who would have thought! Getting my skin clean without drying it or damaging it is always a problem. I don’t have any of these systems but i will try and get one that will keep my skin fresh and clean. I received a Clarisonic as a gift a couple years ago and I stuck it in the bathroom cabinet and never used it. I need to get it out and try it. I love all the different ones you mentioned and there are so many choices these days. Any of these would make a great gift for my daughter’s upcoming birthday. Oh yes! Pull that brush out of the cabinet. Or you can gift it to your daughter. She’d be ecstatic! I would try these. My skin could use the help, especially in the winter. My daughter would want one too. She’s big on keeping her face clean. 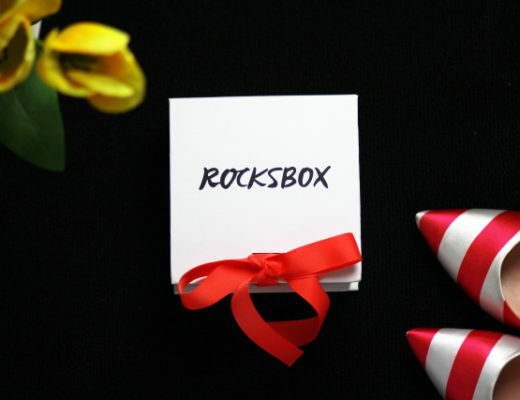 One of these would be amazing for you and her! For those wanting to use an face cleaner like all the ones you have shown it is good to know there are so many out there that won’t cost a fortune. 300.00 is totally not in my price range. I have the Olay brush and love it. Me too! 🙂 I’ll have to give my twin sister credit for pushing me to get it.